accept 80 acres of land in the Seven Hollows section of Petit Jean Mountain as Petit Jean National Park. 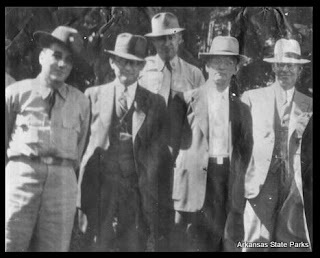 Though the effort was unsuccessful, it did garner local interest, and in 1923 the state legislature named the donated area Petit Jean State Park. lodge from 1933 to 1938. 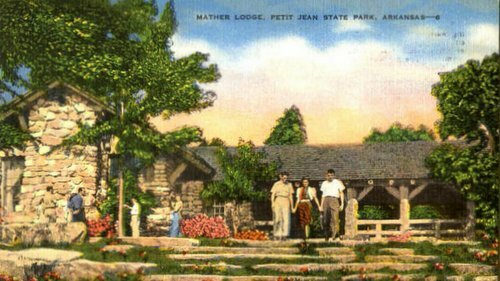 The lodge was named after the head of the national parks system, Stephen Mather, and thus Mather Lodge was born. level with the restaurant and parking lot, and an additional set of rooms accessible by a downward staircase. 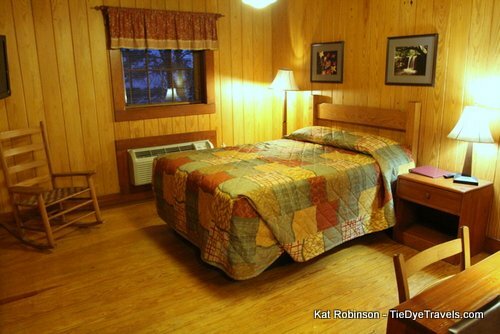 Rooms are large and paneled with wood. Each comes with wooden furnishings such as desks and rocking chairs, and each has its own en suite bath complete with bathtub and shower. the hollows below. 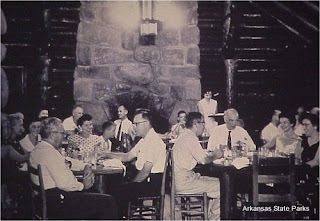 The restaurant has been upgraded, and now you can dine at its heavy wooden tables for breakfast, lunch or dinner. 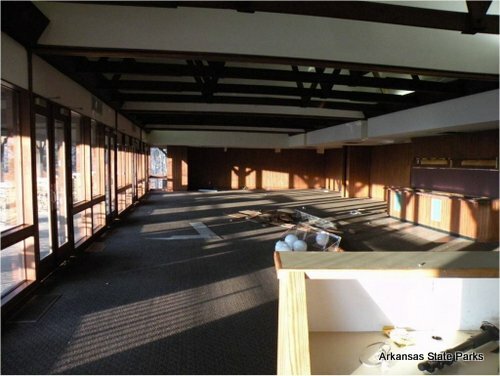 The expansion also included a gift shop area, new conference room with audio visual equipment and a large lobby. 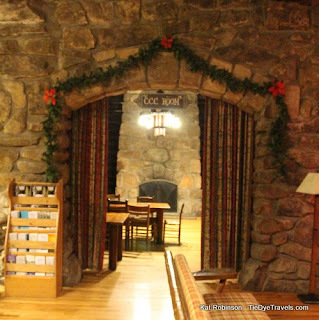 But for fans of the original stone structures, never fear – the original lobby and gift shop areas have been preserved within the overall structure, creating two comfortable rooms that feature original furnishings and fireplaces. 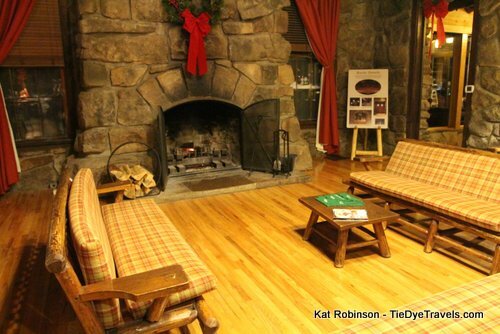 In the evening and especially during the winter months, there are few places better to curl up and read a book. 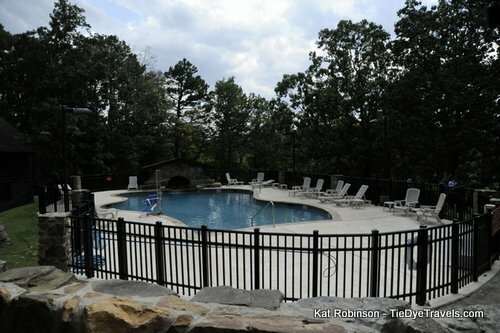 For summer travelers, there’s a big pool on the ridge overlooking the hollows, just beyond the breezeway connecting guest rooms with the lobby and restaurant. This is also an excellent place to view sunsets. There's also usually a breakfast buffet available. 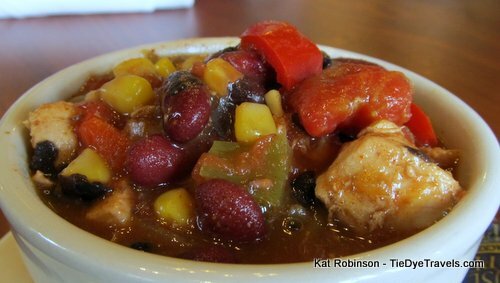 There's always a soup of the day, and this vegetable beef soup is excellent. 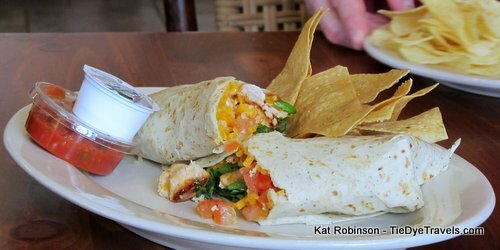 A special Petit Jean Favorites menu includes a number of wraps, such as this chicken fajita wrap. 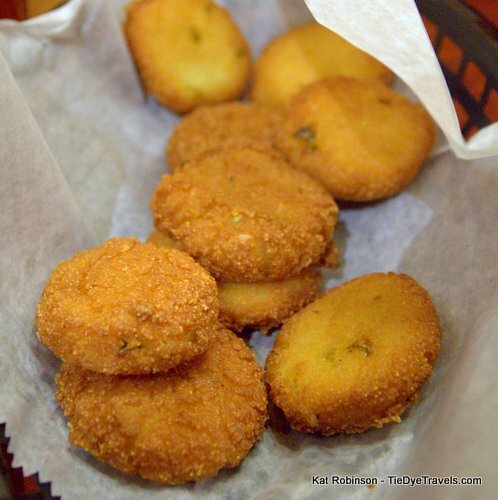 Hot water cornbread is gratis. 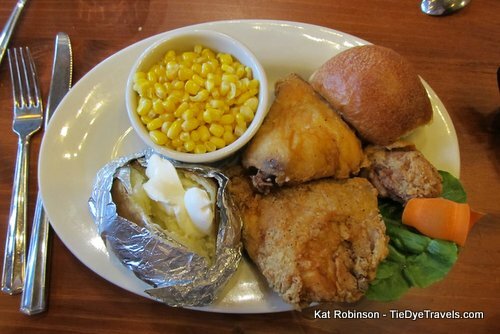 Chicken-fried chicken breast is on the menu, but if the specials include fried chicken, go for it. The bone-in version is better, juicier. A favorite of mine. That being said, the chicken fried chicken is pretty good. 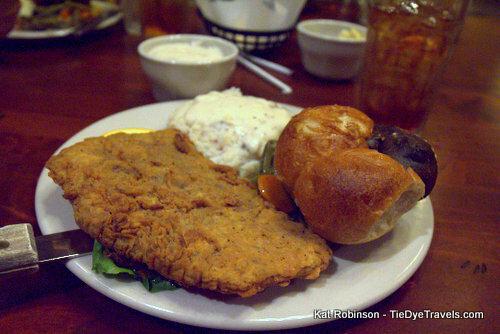 The chicken fried steak is, as you can imagine for a restaurant in the River Valley, pretty dang good. 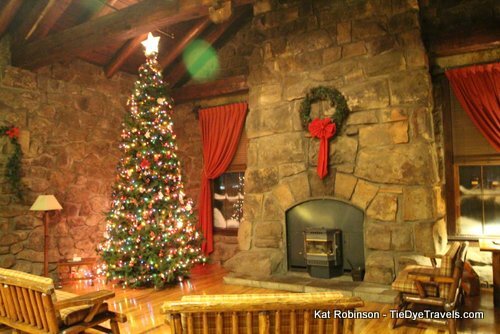 Another Mather Lodge favorite is the Hot Roast Beef. 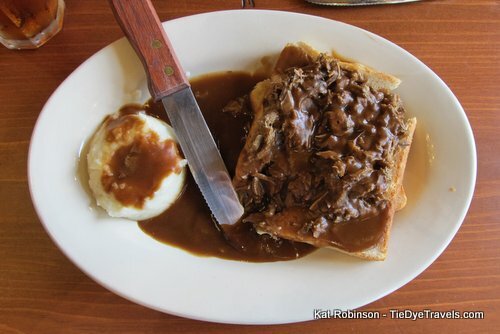 Harking back to the days of early road travelers, this is a simple serving of fall-apart roast beef on white bread with mashed potatoes, swamped with brown gravy. There's always pie at Mather Lodge, and it changes often. This is a slice of Millionaire Pie. 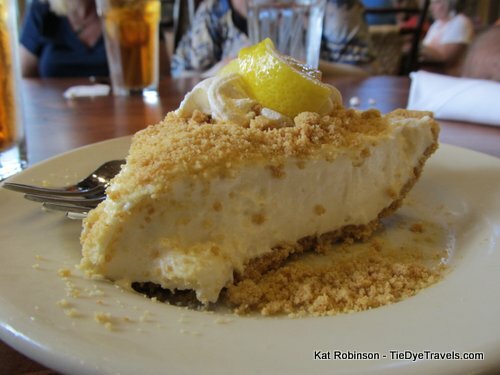 And you might remember this amazing slice of lemon icebox pie from Arkansas Pie. 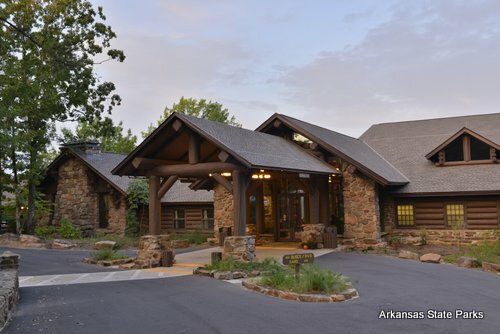 These are the toiletry items offered by all Arkansas State Parks. And they're pretty excellent. 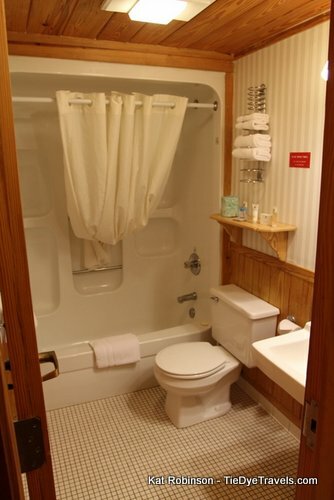 A bathroom in Mather Lodge. 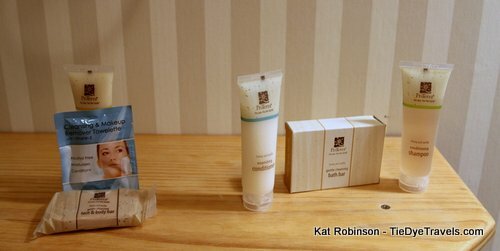 Mather Lodge's gift shop offers a lot of Arkansas products and branded items. 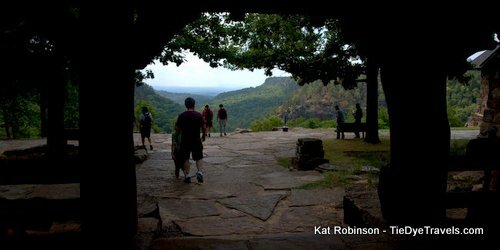 While you're in the park, you need to make a special trip to Petit Jean's grave for one of the most magnificent views of the Arkansas River Valley. 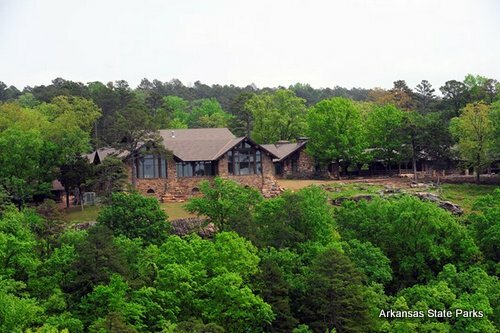 Petit Jean's grave is right on the rim of the mountain. 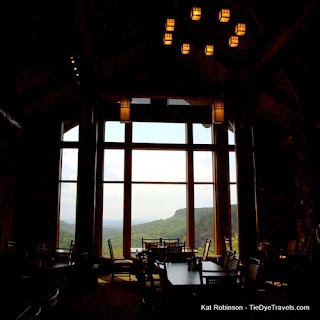 A table for six in the dining room. 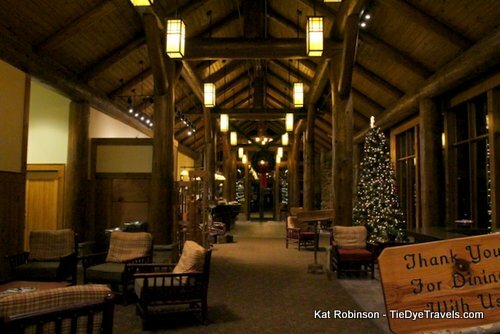 Space that was once a gift shop for the lodge is now a comfortable communal space for guests. For more information, check out the Petit Jean State Park website.